Last week saw things change dramatically on one of our Walbrook sites. In the northern part of the site the masonry walls of the late Roman construction phase were carefully recorded and removed, along with any associated floor surfaces. In the southern part large dump layers were removed. During the excavation of this later archaeology, it was clear that we were getting down onto earlier phases of construction. 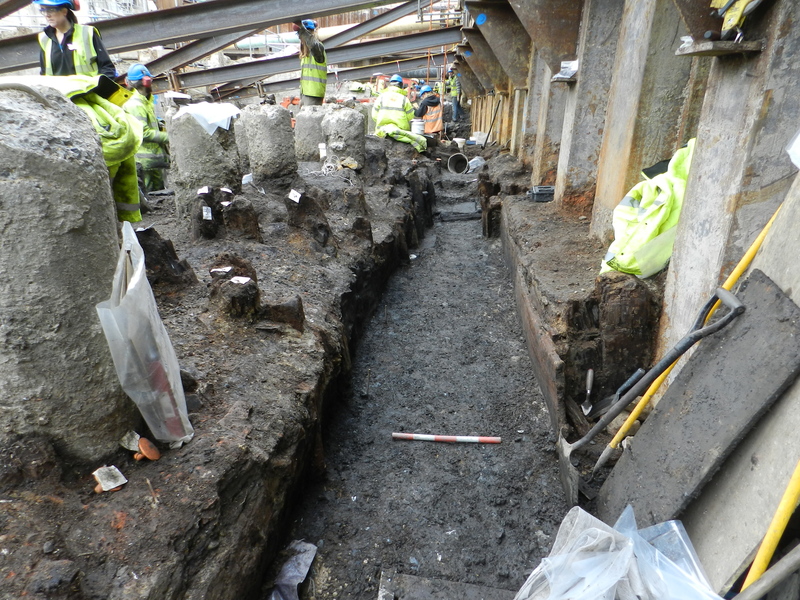 In both areas we could see evidence of timbers poking through. Some of them are posts sticking up through the ground, others are posts and beams visible in the sections of the construction cuts. All of these timbers though make up an exciting new phase… timber buildings! In Roman London a large number of houses were constructed of timber; stone was used for larger public buildings, and only later for private houses. 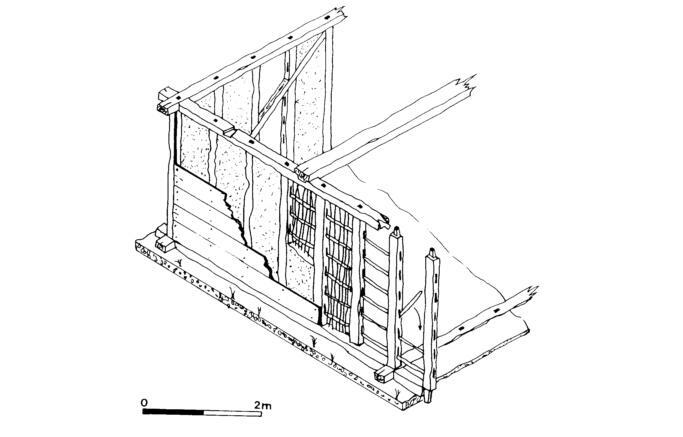 Roman timber buildings were constructed in a number of ways. Usually oak, the posts form the upright element to the buildings. They were either driven into the ground as piles on which the walls sat, to give more support much like we do today with concrete piles; or they were vertical posts, or ‘studs’, supporting the wall and roof. Horizontal beams, also of oak, would have formed the base plates for the walls. These horizontal timbers would have sat on top of the piles, and the studs would have slotted into mortise joints within the base plate. Wattle, planks or earth all would have been used to form the walls. An example of the construction of a timber building can be seen in the diagram below. At the moment on site we have a number of timber buildings. In the north we are starting to uncover the remains of a large rectangular building. 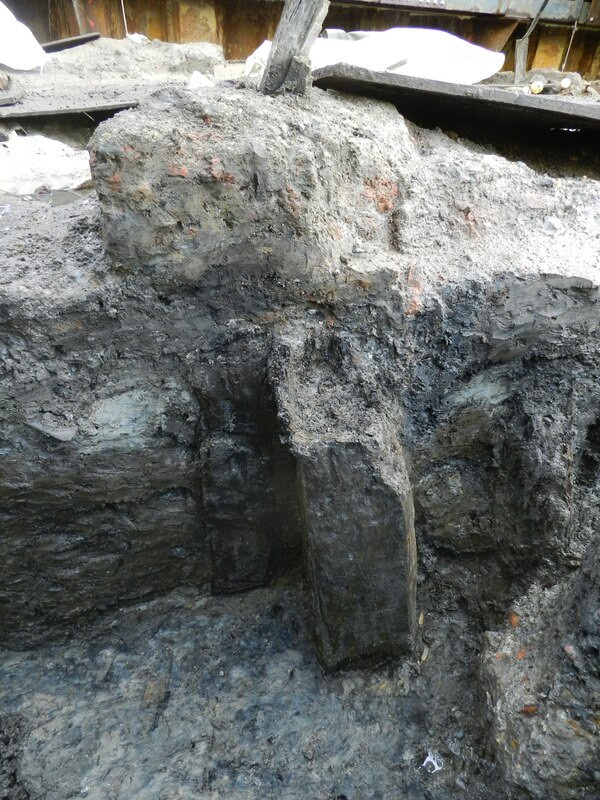 We have not fully uncovered the extent of the building, however we have uncovered one earth wall that is supported by timber piles underneath, and we have spotted some large timbers in section that could be base plates. In the south there are a number of buildings visible. In fact we have two houses next to each other with different construction techniques suggesting that individuals employed their own builders to construct their houses, not one builder for the whole street! These houses extend beyond our area of excavation so will never be fully uncovered; however we do have their western edges that are bounded by an alleyway. This alley way has a fence on either side; around 10m of this survives! The timber buildings on site will be carefully uncovered and a plan will be drawn of their layout. Each timber will be given a number, and will be recorded onto a timber recording sheet. The timber specialist will have a look at all the timbers in situ and once they are removed. He will look for any evidence of tool marks, whether the timber has been reused, and will further record and draw any timbers that are interesting. 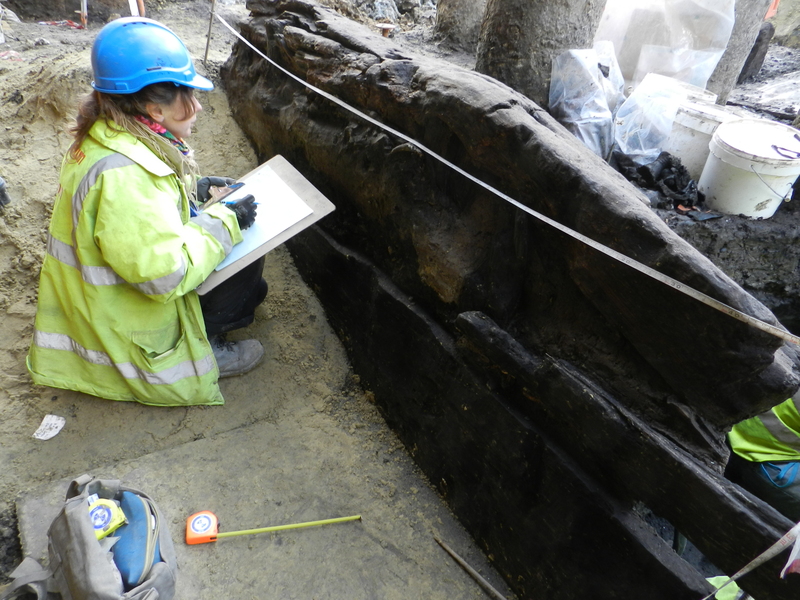 Timbers will also be selected for dendro sampling so we can try and pin down the dates for the buildings. If you would like to know more about buildings and construction in Roman London visit the Museum of London’s Londinium Lite. Click here. I saw a mention once of timber piles used in the amphitheatre at Arles carrying timber stamps (hammered into the wood), much like brick in form & epigraphy. Any indications of that sort of thing here? Thank you for your comment, and thank you for taking the time to read our blog. 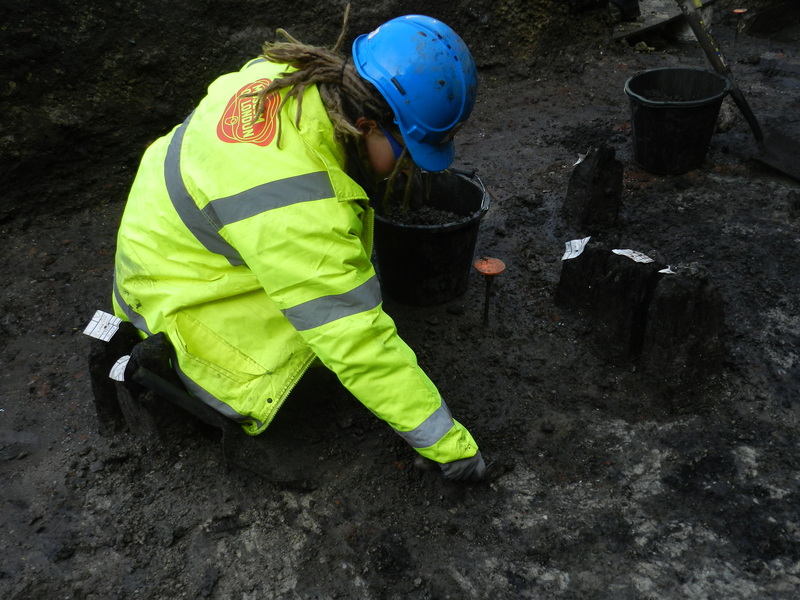 At the moment we have no evidence of stamps or markings on timber posts from our current excavations. Our timber specialist does look at every piece that comes out of the ground though so it is possible that we may come across something similar! If we do we will be sure to post it on here! I’ve just found this site, fascinating, particuarly as I used to work on top of this!! I’m very curious to know what happens to what you know is there but outside of your area of excavation? Hi Amanda, thanks for looking at our blog! Interesting isn’t it to think what is under your feet! You are quite right, we do know there is archaeology outside of our area of excavation, but basically this is left in the ground. Believe it or not, archaeologists like to leave things in situ if we can. Techniques and technologies get better all the time and the more we can leave in the ground for future studies the better. Also there are financial considerations, in that excavations are an expense for the developer and they are unlikely to pay for work that is not entirely necessary for construction. If or when these areas are eventually excavated, the results are always compared to the findings from other sites. So for example with this site we will be looking at the findings alongside those of No 1 Poultry. Hope that answers your question!